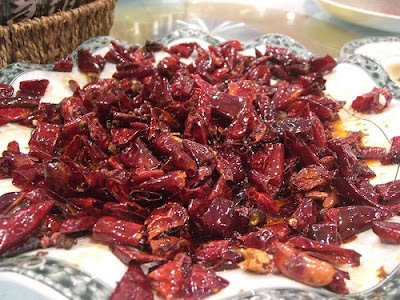 In general, Sichuan cooks specialize in chilies and hot peppers and Sichuan dish is famous for aromatic and spicy sauces. You may ask, what so special about spicy pepper, the best it can do is just make you sick? And yes, you are correct. However, Sichuan pepper does not grow with the intensity after you eat it (I cannot say the same with Atomic favor at Wing Stop restaurant). What it does is gives you a burning or tingling sensation when it touches your lips. It could scare you at first (or worst pee your pant), but shortly after that the pepper will leaves with a numbness feeling. If the hot is unbearable to you, eat something sweet to cool it down. Cake can be a perfect solution. Characterized by its spicy and pungent flavors, Sichuan cuisine, with a myriad of tastes, emphasizes the use of chili. Pepper and prickly ash are always in accompaniment, producing the typical exciting tastes. Garlic, ginger and fermented soybean are also used in the cooking process. Wild vegetables and meats such as are often chosen as ingredients, while frying, frying without oil, pickling and braising are used as basic cooking techniques.